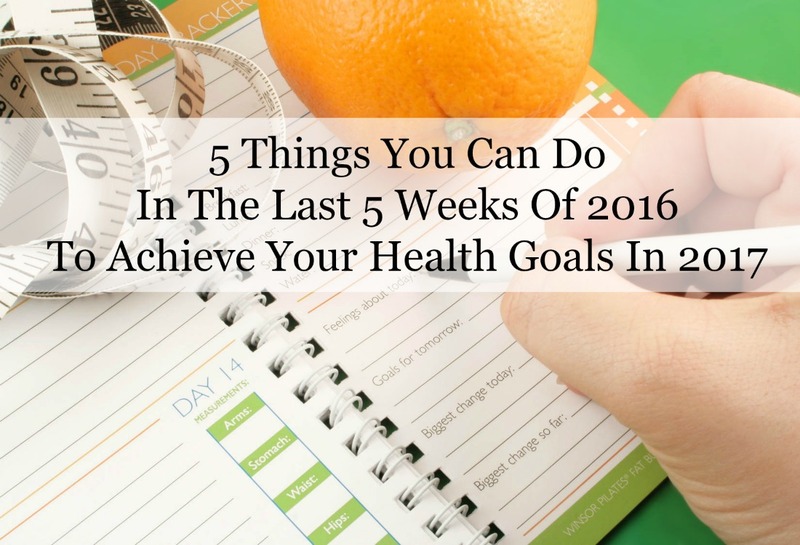 5 Things You Can Do In The Last 5 Weeks Of 2016 To Achieve Your Health Goals In 2017 - Welcome to SarahKesseli.com! I can’t believe we have finally arrived at the last month of 2016! Where has the year gone? The next few weeks will be filled with family, friends, parties and lots of good food! All of which should be enjoyed! The weeks leading up to Christmas and New Years are normally busy, stressful and sometimes overwhelming. The chaos has a tendency to throw us off track with listening to our bodies. Be it too much food and not enough exercise, or not enough food (who has time to eat when there are presents to wrap!) and too much exercise, we all have our traps. So, instead of pushing all of those healthy habits aside during the holidays and then ‘punishing’ yourself with low calorie diets and extreme exercise plans, why don’t we set ourselves up for success by implementing (or continuing to follow) these 5 Things You Can Do In The Last 5 Weeks Of 2016 To Achieve Your Health Goals In 2017! Week 1: Pick An Exercise Schedule That Is Realistic For The Holiday Season. Also, try to stay away from the black & white mentality. We often say, “Well I don’t have 45 minutes, so I am not going to do anything.” Even 10-15 minutes of movement will add up over the course of the week! Week 2: Find Healthy Recipes You Can Enjoy. Who doesn’t love traditional holiday comfort foods? I know I do! But, since the invention of Pinterest (thank you to the creator of this amazing place!!) we can now find an abundance of healthy alternatives to our favorite holiday dishes! No one said to swap out all of your favorites for a healthier version, but even trying 1-2 recipes will add up quickly! Just think, how great would it be to enjoy your holiday favorites and stay on track during the holiday season?! Now, that is a win in my book! Week 3: Work On Eating Intuitively. This will probably be the hardest of them all during the holidays. All of a sudden a co-worker brings in a plate of fresh holiday cookies and your stomach starts rumbling for them despite having just ate lunch. Are you truly hungry? Probably not. So instead of heading straight for the plate, stop for a minute and tune into your hunger and fullness cues. Think about whether or not this is a holiday dessert that you really want! We all have our favorite desserts that we can’t live without (Insert: my grandmother’s homemade peppermint brownies pictured above. I die every year waiting for these!). If you decide that it is something you would truly like to enjoy take one and eat slowly. Enjoy each bite. Savor it. Listen to your body. Week 4: Take Time For Self-Care. I have said this time and time again, but self-care is so important! If we do not take time out for ourselves to relax, decompress and tune into our needs, our body stay in flight mode. The body will stay in a high-stress level around the clock! When we are in high-stress mode, our cortisol levels go up, and our cravings for sugar and sweets kick in times 1,000! Our bodies will also hold onto body fat making us think we have gained weight. Do we see where this is going? We now think we have ‘gained weight’ so we say, “Well, I might as well enjoy all the holiday foods since I have blown it!” Come January we have gained more weight than we would have liked and…crash. diet. Self-care doesn’t have to mean massages and expensive trips to the nail salon. It can be reading for 20 minutes with a hot cup of tea, taking your dog for a leisurely walk, or going to a restorative yoga class. Even a movie in with your husband or girlfriends is self-care! Week 5: Laugh & Celebrate With Family & Friends. The holidays are meant to be enjoyed! Relish in the company of good friends and family, eat and drink the foods you love, and above all create lasting memories! Enjoy that glass of champagne, your grandmothers famous mint brownie squares or an extra serving of mom’s homemade stuffing! By combining laughter, relaxation, intuitive eating, health recipes and a bit of movement over the next five weeks, you will be setting yourself up to start off 2017 in a happy and healthy place! What are some of your favorite tips and tricks to staying on track during the holiday season? How do you set yourself up for success heading into the new year?